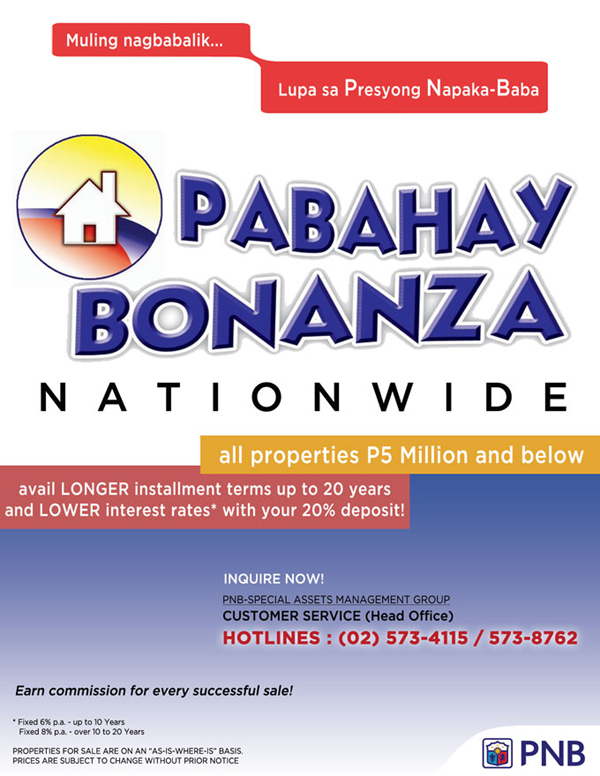 PABAHAY BONANZA (PB) is PNB’s special program on the sale of its nationwide ROPA or acquired assets with appraised value of P5.0 Million and below. This program allows buyers to enjoy lower INTEREST RATES at longer terms! I’m interested now. Where and how can I inquire about the PB properties? You can inquire at any of our PNB branches nationwide or visit us at the PNB Head Office (9th Flr, Special Assets Management Group) Pasay City. You may also call us at (02) 526-3131 or (02) 891-6040 Locals 4115, 4713 or 4539. Look for Jen, Tania or Notch. Or email us at properties@pnb.com.ph to learn more about our properties. I’m looking for properties located at a particular area. Can you provide me a listing of all the available properties in that area? We can email you a complete listing of all our properties from your desired area upon your request. The listing will include the location address, lot area, and indicative price. You may also download the listing from the PNB website, www.pnb.com.ph. I want to take a look at a property’s current condition. Am I allowed to inspect the property? You certainly can! In fact, we encourage all our buyers to visit a property before purchase as all our properties are sold on an AS IS-WHERE IS BASIS. For further details, you may call us at (02) 526-3131 or (02) 891-6040 Locals 4115, 4713 or 4539 or email us at properties@pnb.com.ph. Please take note that some properties may have occupants, pending legal issues or titles that are not yet consolidated in PNB’s name. Also, please be advised that buyers shall shoulder the expense of ejecting the occupants of the property. Similarly, any legal impediment on the property shall also be at the buyer’s expense. On the other hand, prior to the sale of the property, any unpaid capital gains tax (CGT), documentary stamp tax (DST), and RPT (Real property taxes) and the like will be at the Bank’s expense. I have examined the property and I’m excited to make my purchase. What is the procedure for purchasing the property? EASY! Just go to your nearest PNB branch and inquire about the PABAHAY BONANZA SALES KIT which will give you detailed instructions on how to purchase a property. 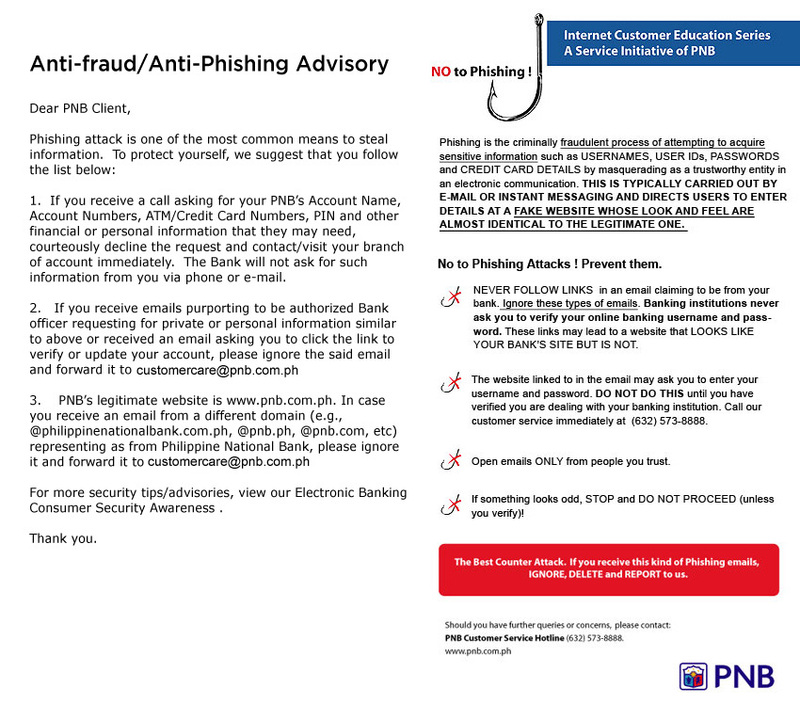 Or download the forms and checklist from the PNB website, www.pnb.com.ph. Aside from the Sales Kit, are there other documents that I need to accomplish? You can find this checklist in your PABAHAY BONANZA SALES KIT. Or at the PNB website, www.pnb.com.ph. I have completed all your requirements. Where can I submit my documents and purchase proposal? Please submit your Purchase Proposal along with the necessary supporting documents to any of our fourteen (14) PNB REGIONAL ASSET MANAGEMENT CENTERS (RAMC) nationwide. You may find the location and other details regarding our RAM Centers inside the Sales Kit. How much should I give as deposit? Your deposit should be at least 10% of the offer price per property. Once the sale has been approved by the Bank, the deposit will be considered as down payment. However, if your proposal will be disapproved, the bank will refund the exact amount you deposited without any charges or interest. You can go to your nearest PNB Branch to make your deposit. Please fill up a DEPOSIT / BILLS PAYMENT SLIP under the Account Name, writes Acquired Asset Payment, while for the Reference No, Indicate the Title ID or Title No/s. Do not forget to put the Buyer’s name under the Plan holder’s Name portion. What is the interest rate if I wish to pay via installment? I wish to pay via installment basis. How do I apply for this? In your Purchase Proposal (found in the PB Sales Kit), please indicate that you are buying via installment payment. To help you compute the approximate monthly amortization based on the number of years, you can also find a Factor Rate table in your Sales Kit. Also, please be advised that additional supporting financial documents may be required from you. I am the former owner of a property being sold in the Pabahay Bonanza List. Can I buy my property back? YES. Former owners, their relatives, current occupants of the property and third-party buyers are all welcome to buy any property from the PB List. I have submitted all the needed documents, how will I know if the sale has been approved? You will receive a “Notice of Approval,” if sale was approved; or, “Notice of Disapproval,” if sale was disapproved within (2) two days from date of management’s approval/disapproval of said sale. If your payment is CASH, you will be asked to pay the balance within 30 days upon receipt of the Notice of Approval. If your payment is via INSTALLMENT, the remaining balance shall be via check payments or automatic debit authority (ADA). If you received a Notice of Disapproval, you may request that the withdrawal/refund of your deposit be made in any PNB branch near you. For any further inquiries, you may call any of the PNB Regional Asset Management Centers (RAM Centers) or the Main Office at (02) 891-6040 to 70 or (02) 526-3131 and connect to Special Assets Management Group’s Sales Account Officers. The sales team will be able to update you on your proposal. What if I want to sell PB properties instead of buying? Do you have a program for real estate brokers or referrers? YES, we have. Our Broker/Referrer Program allows both licensed Brokers and the general public to sell PB properties. You may also call us at (02) 526-3131 or (02) 891-6040 locals 7212 or 4538. Look for Jenny Vi or Ricky. Or email us at refer@pnb.com.ph to learn more about this program.